I spent this weekend in Plymouth, MA. 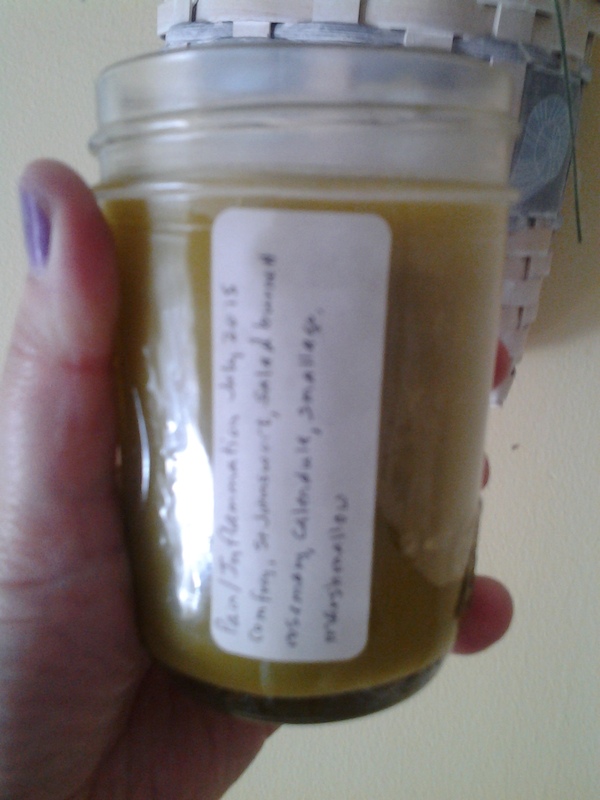 Saturday morning I participated in a salve-making workshop at Plimoth Plantation. Just like our ancestors, we decided which ailments we wanted to heal, decided which herbs would be best, and participated in making the salve from start to finish. There were only 2 participants, so lots of hands-on time. Sydney and I each decided we wanted a salve that would soothe muscle and joint pain and inflammation. Together we came up with the following list of herbs: comfrey, St John’s wort, marshmallow, callendula, smallage, rosemary, and salad burnet. 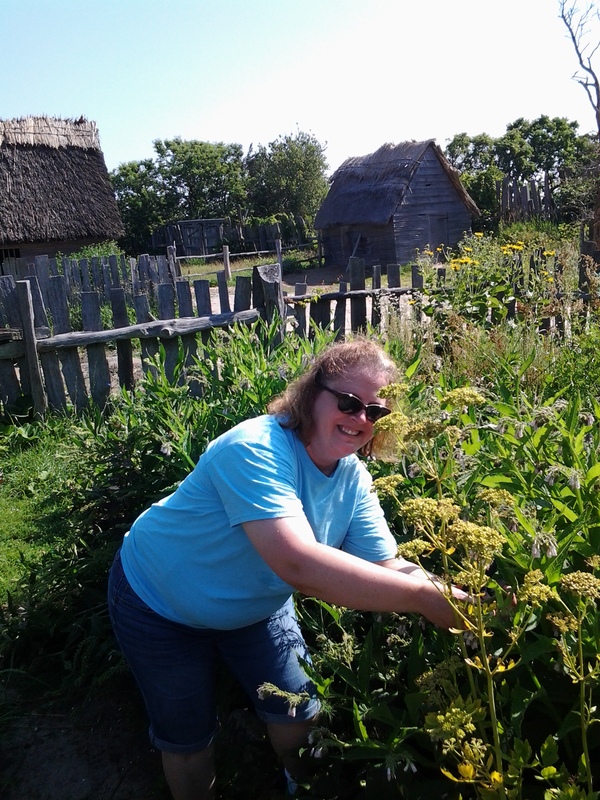 We then went out to the gardens at Plimoth Plantation to pick what we needed. 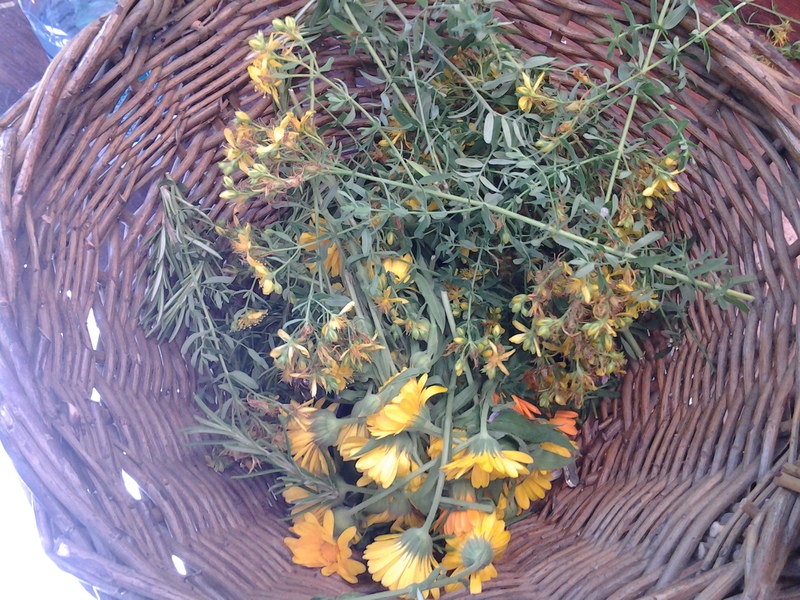 We filled two big baskets–we took flowers, leaves and stalks. 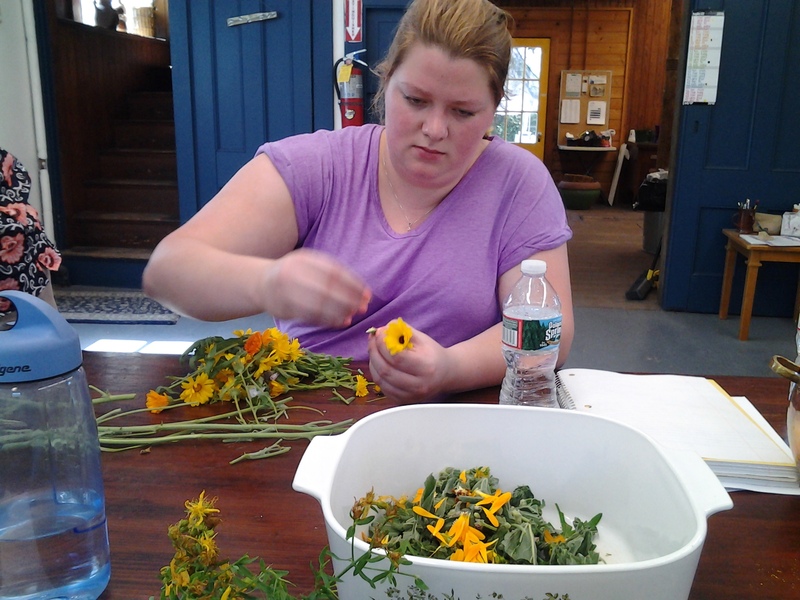 We then went back to the work area and ripped up all the buds, flowers, leaves and stalks. This is Sydney. We filled that casserole dish about 1/2 – 3/4 full. We covered it all with olive oil and let it simmer for 2 hours. While an intern kept watch over the herbs, the workshop leader and participants went back into the village and learned more about plants. We also spent some time talking with one of the interpreters who knew quite a bit about medicine. She mentioned that while salves were made, herbs were limited in the early years of Plymouth for most people, so often herbs were used fresh. As an example, she had just been stung by a wasp and rubbed fresh thin leaf plantain and a few other herbs on it while we talked. She also mentioned bloodletting was usually done in the spring to purge the toxicity from the heavy winter diet. 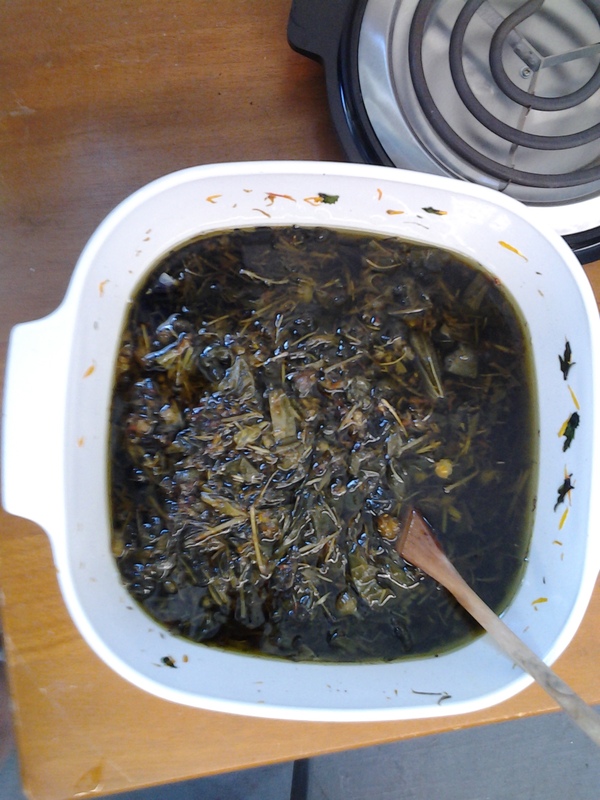 Once the herbs had simmered for 2 hours and looked like this, we strained them through cheesecloth, put the pot back on the burner and melted beeswax. At that point it was ready to pour into jars. It will keep for about a year. 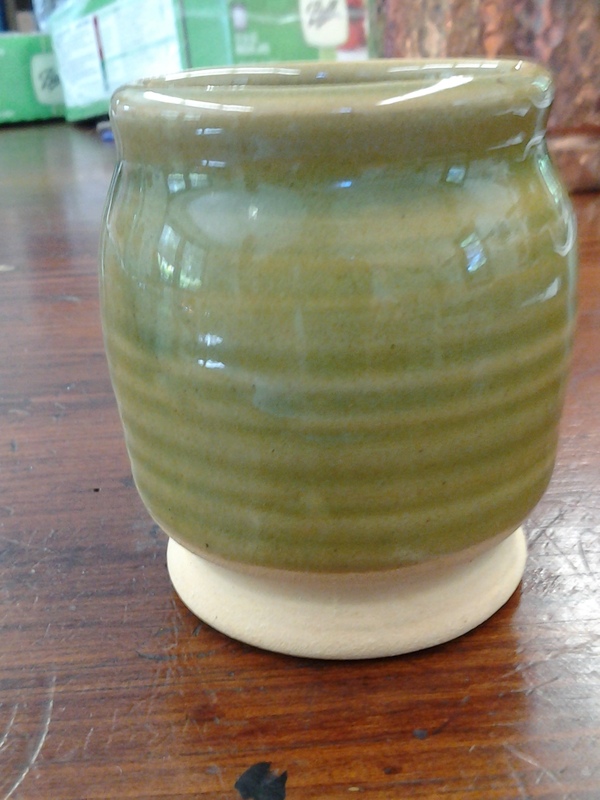 In the 1600s they would have used pottery salve pots like these, covered tightly with paper or cloth, for storage. I definitely gained a greater appreciation for all the hard work involved. I am becoming better at gardening, but am still not an expert. I broke the pruning shears and was very grateful for the breaks in the AC on a hot day. We didn’t slave over a fire, but used a stove burner.